Let’s face it! While we are giving THANKS to the food that is presented to us as well as THANKFUL for being alive, we are going to definitely be getting our grub on. After you have finished stuffing yourself silly and regretting eating that last piece of pumpkin pie, get yourself to Heartbeat House Dance Studio for a workout so that you can BURN, BURN, BURN those calories away and why not do it with US! Join myself along with the Afro-Funk Goddess herself, Tanita, for what promises to be an uplifting, calorie burning, cross-cultural CARDIO JAM. 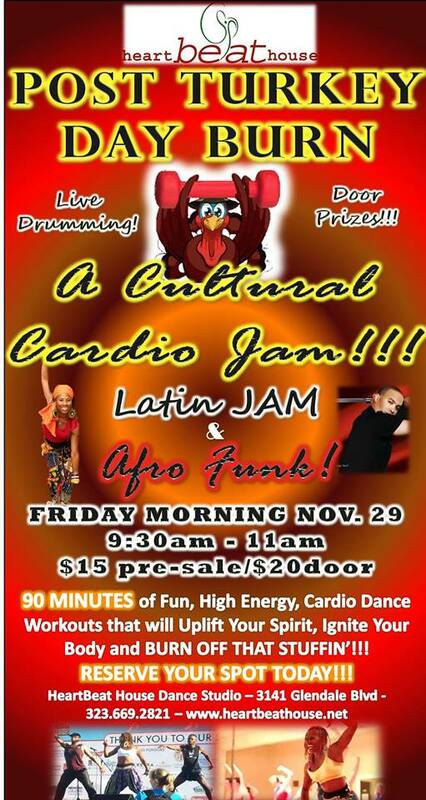 It’s LATIN JAM WORKOUT and AFRO-FUNK FITNESS in one room for 90 minutes (FRIDAY, NOVEMBER 29th from 9:30AM-11:00AM). We’ll also have some LIVE DRUMMING to spice up the fest as well. This will not be your average, ordinary class! If you’ve always been curious about my unique version of Latin Jam Workout and haven’t had the chance to take it AND if you’ve always been curious about Afro Funk Fitness and haven’t been able to take it, come do BOTH! We’ll work off all that stuffin’! In addition, we will have ENERGY punch courtesy of ARBONNE as well as a FREE CLASS PACKAGE GIVEAWAY and CDs for those who register online! Tickets are $15 in advance & $20 at the door! Space is limited! REGISTRATION LINK: https://clients.mindbodyonline.com/ASP/home.asp?studioid=13792 OR you can register by calling the studio at (323) 669-2821.